The trouble with sketching is that I need to sit down to do it. And I haven't yet got to the point where I feel comfortable enough to whip out a folding stool and leave Chris standing there while I do a quick sketch. 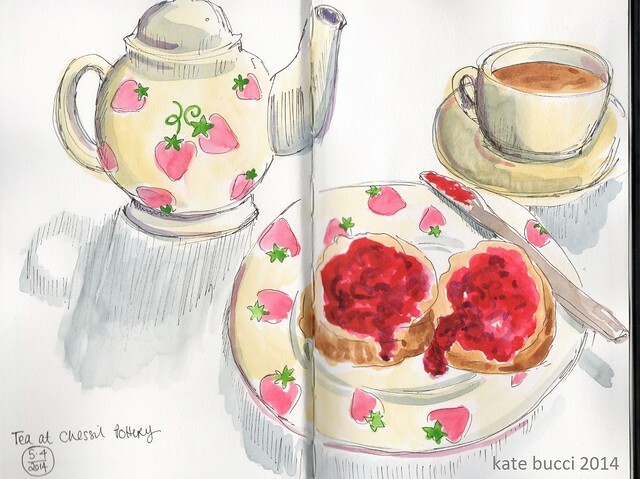 Inevitably, this means that there is a fairly large number of food and drinks recorded in my sketchbook - mostly tea and cake. Sometimes I feel self-conscious about it: "Oh no, I don't want to look as though all I do is eat." But hey, if it's good enough for this lady then it's good enough for me. 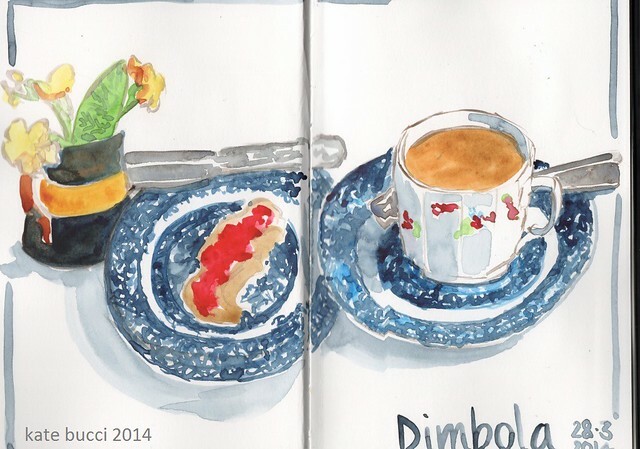 This page at Dimbola was an experiment in working straight in with a paintbrush rather than sketching first. I found it very difficult and the blue pattern nearly drove me potty. Looking back with the benefit of a couple of month's hindsight, though, I can see things about this sketch that I really like - the shape of that vase at the back, and the shading on the cup which was an interesting shape. I should probably make the effort to work without a pen more often. These are beautiful! And so fun to recognise the places you paint. I tried to get in to Chesil today but it was packed!! Now, where did I get to?